Our great thanks go to Dave Bugni who has supplied us a trove of photographs he took while on the Cardinal Pennant staff. 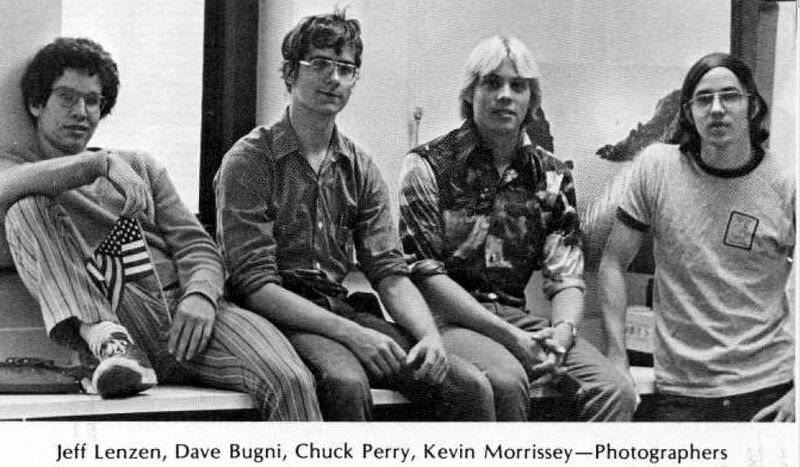 He is seen in the picture at the left along with our classmates Jeff Lenzen, Chuck Perry, and Kevin Morrissey. At the time Dave was just a Sophomore and he would continue as a photographer for the next 2 years. Though many of these photos did make it our yearbook, many did not and even if they did, they are now in much higher quality than could be printed. Regarding the photos, Dave wrote to me that he took all of the one's he supplied. His story is he completely forgot about all the negatives (over 2,000 photos), but when he was cleaning out his parents things about 10 years ago, he came across a box with all of them - they had saved all the old negatives. He had his own dark room as a kid, so his parents must have saved them when they took it down after he left for college. Back in about 2009 he started to digitize them and it is a slow process to restore some of them. At the current time he has half of them completed, but most of the rest are not very good. My sincere thanks to this monumental effort of Dave and it is my privilege that I can proudly display them on our website for all of you to enjoy.